I once drove 11,000 km (6,875 miles) with my father, from Montreal to California and back in 11 days. 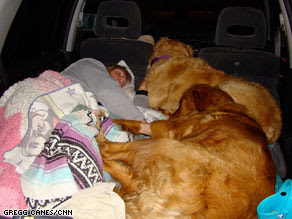 I often had to sleep in my car. It's not that comfortable, but you get used to it and can endure for a few days. I couldn't imagine it was a way of life for some people. I was very surprised to learn that some people who lost their jobs are living in their cars across the US. A growing number of cities even have designated parkings where they can park and sleep. One of them is Barbara Harvey, a 57 year old mom from Santa Barbara who sleeps in her Honda CRV with her 2 golden retreivers. We're not talking about gipsies in some remote corner of the Balkans or the Third World, it is hapening right now in California, the richest state of the richest country in the World. Publié par Unknown à l'adresse 8:53 p.m.
Mmm... I don't have enough money to buy all the things I want. Should I buy them anyway? September 3, 2008 at 3:25 p.m.